The Provincial People's Committee calls for the transfer of the father superior for his protests against land grabs at the expense of the monastery. The authorities have long sought to seize 110 hectares of protected forest and eradicate religious practice. The compound has been attacked by thugs to frighten Catholics and convince them to leave the area. 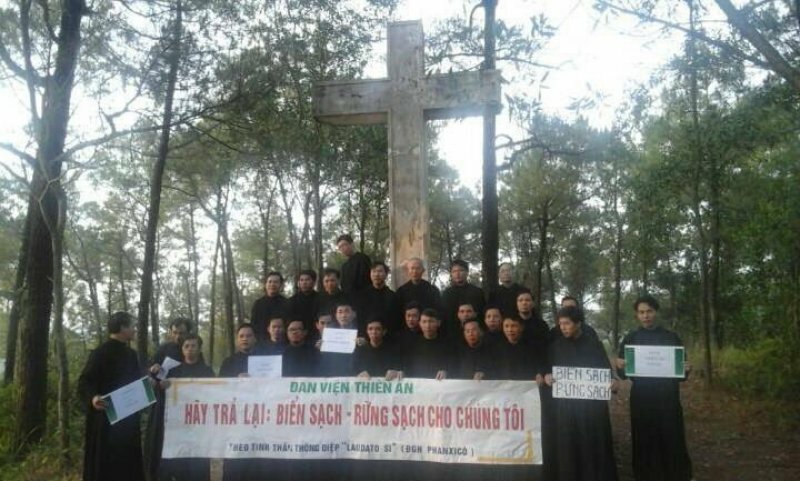 Hanoi (AsiaNews) – The monks of the Benedictine monastery of Thiên An, in the archdiocese of Huế (Thừa Thiên Huế province), have launched a protest against the interference by the authorities in the life of their community. Backed by local Catholics and interfaith associations like the Vietnam Interreligious Council, they have accused the president of the province and his deputy of abuse of power and using pressures to remove their superior, Fr Nguyễn Văn Đức. "These people have broken the law,” the monks say in a letter. “They have violated the law and intervened in the internal affairs of a religious organisation; they have offended the dignity and honour of the monks and the father superior of the monastery of Thiên An Huế. They also instigated others to break the laws of Vietnam." Although authorised under Vietnamese law, the monastery is at the centre of a painful dispute with the Communist regime, which has long tried to eradicate religious practice and seize the building and the more than 110 hectares of protected forest that surrounds it. For years the local administration has sought to grab the area and compound to turn it over to a travel agency. The monastery is home to priests, nuns, religious and seminarians who perform pastoral outreach (for Catholics and others) in three different churches of the city. The monastery of Thiên An Huế and the pine forest are the lungs of the city of Huế and attract millions of visitors. The region benefits from it from an environmental and spiritual perspective. The archdiocese of Huế, which covers two provinces, has about 70,000 members and 78 parishes. In a report dated 23 December, the Provincial People's Committee offended the dignity of Fr Nguyễn Văn Đức and illegally interfered in the internal affairs of the monastery. Officials have in fact accused the clergyman of breaking the law, when he protested against expropriation attempts. In order to sow dissent within the monastery and the Catholic community, the authorities even sought to have the superior general of the Benedictine Order transfer him. Locals and some Vietnamese legal experts have publicly stated that "the Provincial People’s Committee has taken on the role of investigating agency, prosecution, and court in order to assert that Fr Nguyễn Văn Đức violated the law.” However, “they have no sentence nor ruling from a court. There is no evidence to support what they say." The monastery, founded on 10 June 1940 by French missionaries, is often attacked by thugs hired by local authorities to frighten Catholics and persuade them to leave the area. In addition, police have on several occasions raided the place, breaking into the compound, and threatened to occupy it. The cross and the statue of Jesus Christ, desecrated on 28 June2017, were destroyed in 2015 and 2016 and promptly rebuilt by monks and believers.